I’m seeking a few things in a church that are musts. Call me picky but I believe these are very important things. Sinners – People who know that they are sinners, saved by grace, through nothing they did, it’s God’s gift, Christ’s work. They are not holier than thou, looking down their nose with the “at least I never…” attitudes. I am not seeking perfection in others, I’m seeking a body of believers that knows they fall short of the mark but know that because our Heavenly Father sees us through the blood of Christ, we are perfect. Folks that don’t judge you, but grab you and give you a hand up back on the path, help brush you off, and wrap around you in love and support. Bible – a church that teaches from it. USES their bibles, applies the lessons right here where the rubber is meeting the road, but that the congregation members actually show up with their bible in hand and use it during services. And that lessons are not based on a verse taken out of context but passages as a whole and some inductive study (associated passages) pulled together. One verse sermons don’t cut it, I can prove Adam and Eve were blind if we are going to use a verse out of context (their eyes were opened blah blah blah). I want to be with a congregation that can sit down, pull out their bibles and find those passages and discuss, apply, encourage and teach from God’s Word. It’s fine to put it up on a screen for those that forgot, or don’t yet own a bible, but I don’t want to be where that is the only source of God’s Word being used by those listening is the words up on the screen and not in their laps. Music – it can make or break worship. I am all about music being joyful (make a joyful noise unto the Lord), rather than feeling I am sitting in a funeral. Which, for my own way down the road, please make sure the music is upbeat! CELEBRATE my life don’t mourn it. 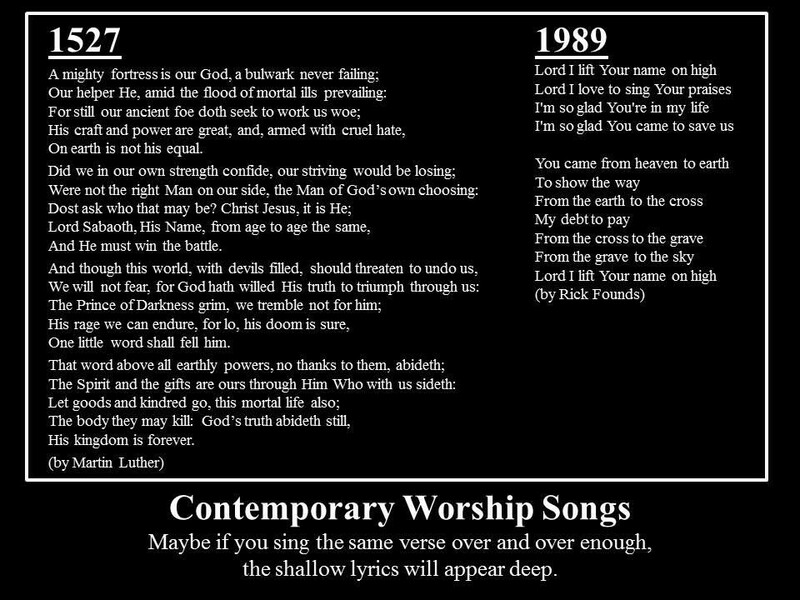 I love contemporary worship music, but I also love the hymns. There is a lot of biblical truth in the hymns of old and they should not be forgotten but used each week along with more upbeat worship songs. I have NO problem with a coffee bar or donut shop in the church building. I love to see fellowship encouraged! People actually sitting down talking and interacting with one another. But I also want to see that the focus of that time together is a collective worship of the Lord, a time to be taught. I don’t think I am asking too much. This says it ALL as far as the music is concerned. Marti – I think we fit the bill! We are definitely a collection of sinners redeemed by grace and we know it!! our pastor preaches from the bible, we carry our bibles to church and many of us take notes. I have a full sized notebook I carry each week to record my notes. SUnday School is right before church and there you really get into the scripture and learn and discuss. We do not have a coffee shop or cafe or anything of that sort. People tend to mingle in the hallways. We do have various social activities throughout the year. Hope you still plan to come and check it out.